The CN Tower, located in downtown Toronto, Ontario, Canada, is a communications and tourist tower standing 553.33 metres (1,815.39 ft) tall. It surpassed the height of the Ostankino Tower while still under construction in 1975, becoming the tallest free-standing structure on land in the world. On September 12, 2007, after holding the record for 31 years, the CN tower was surpassed in height by the still-under-construction Burj Dubai. 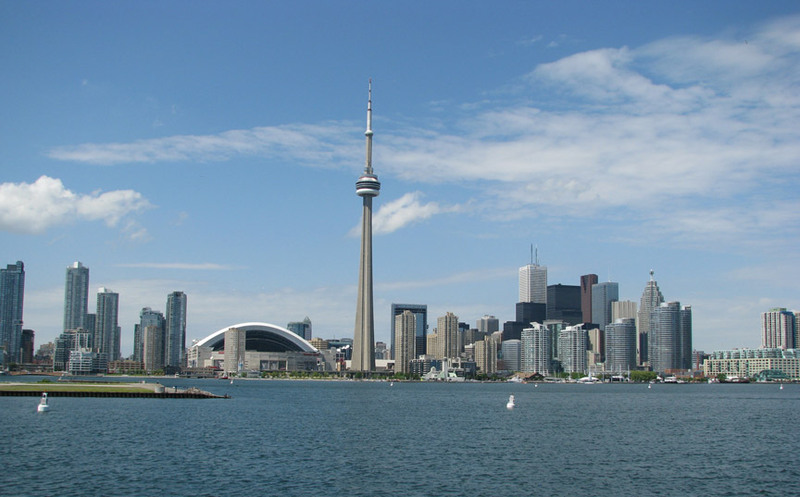 It remains the tallest free-standing structure in the Americas and the signature icon of Toronto's skyline, attracting more than two million international visitors annually. 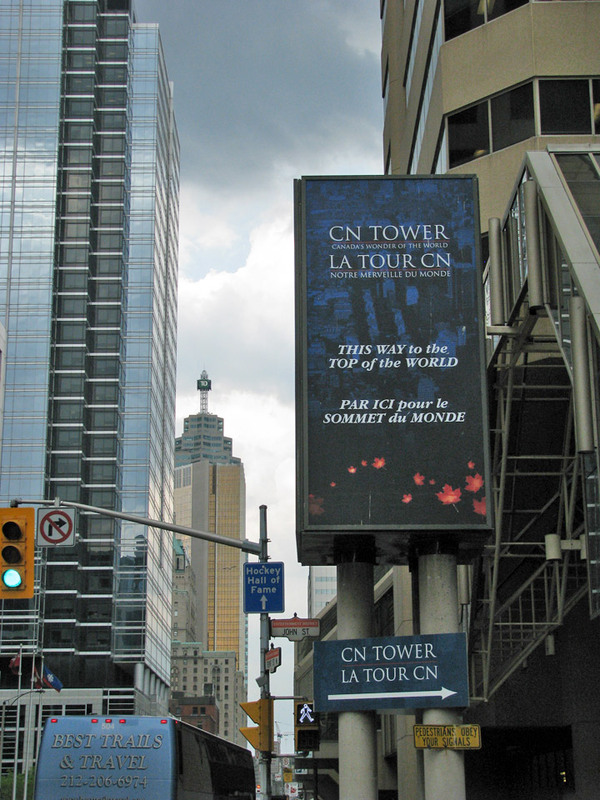 CN originally referred to Canadian National, the railway company that built the tower. Following the railway's decision to divest non-core freight railway assets, prior to the company's privatization in 1995 it transferred the tower to the Canada Lands Company, a federal Crown corporation responsible for real estate development. 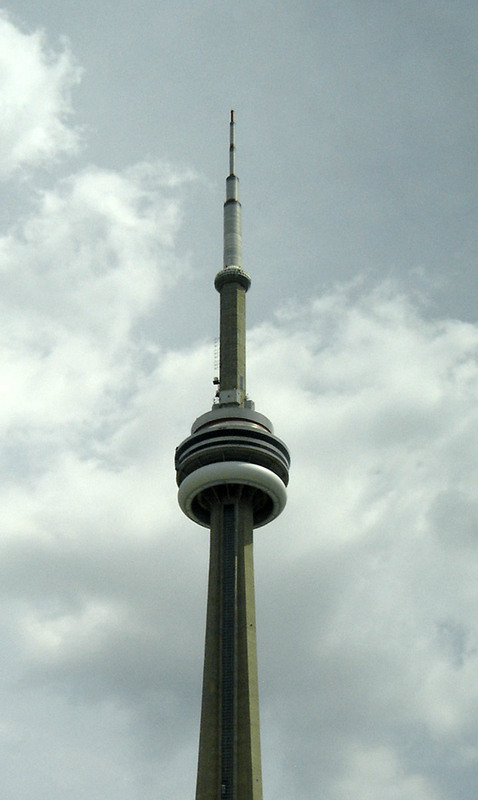 Since local residents wished to retain the name CN Tower, the abbreviation is now said to expand to Canada's National Tower rather than the original Canadian National Tower; however, neither of these are commonly used. In 1995, the CN Tower was declared one of the modern Seven Wonders of the World by the American Society of Civil Engineers. It also belongs to the World Federation of Great Towers. 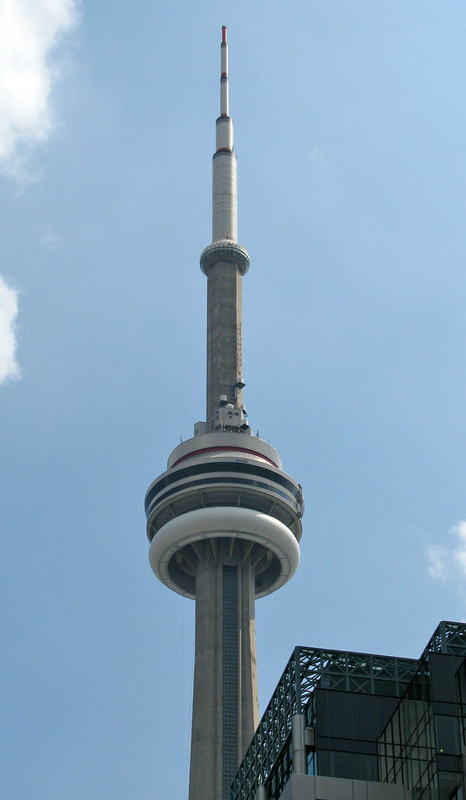 The concept of the CN Tower originated from a 1968 Canadian National Railway desire to build a large TV and radio communication platform to serve the Toronto area, as well as demonstrate the strength of Canadian industry and CN in particular. These plans evolved over the next few years, and the project became official in 1972. The tower would have been part of Metro Centre, a large development south of Front Street on the Railway Lands, a large railway switching yard that was being made redundant by newer yards outside the city. Key project team members were NCK Engineering as structural engineer; John Andrews Architects; Webb, Zerafa, Menkes, Housden Architects; Foundation Building Construction; and Canron (Eastern Structural Division). At the time, Toronto was a boom town, and the late 1960s and early 1970s had seen the construction of numerous large skyscrapers in the downtown core. This made broadcasting into the downtown area very difficult due to reflections off the buildings. The only solution would be to raise the antennas above the buildings, demanding a tower over 300 meters (984 ft) tall. Additionally, at the time, most data communications took place over point-to-point microwave links, whose dish antennae covered the roofs of large buildings. As each new skyscraper was added to the downtown, former line-of-sight links were no longer possible. CN intended to rent "hub" space for microwave links, visible from almost any building in the Toronto area. The CN Tower can be seen from at least as far away as Gamble Street in Richmond Hill, Ontario, approximately 30 kilometers (19 mi) to the north, and from several points on the south shore of Lake Ontario, 48 kilometers (30 mi) to the south. The original plan for the tower envisioned a tripod consisting of three independent cylindrical "pillars" linked at various heights by structural bridges. Had it been built, this design would have been considerably shorter, with the metal antenna located roughly where the concrete section between the main level and the Sky Pod lies today. As the design effort continued, it evolved into the current design with a single continuous hexagonal core to the Sky Pod, with three support legs blended into the hexagon below the main level, forming a large Y-shape structure at the ground level. The idea for the main level in its current form evolved around this time, but the Sky Pod was not part of the plans until some time later. One engineer in particular felt that visitors would feel the higher observation deck would be worth paying extra for, and the costs in terms of construction were not prohibitive. It was also some time around this point that it was realized that the tower could become the world's tallest structure, and plans were changed to incorporate subtle modifications throughout the structure to this end. 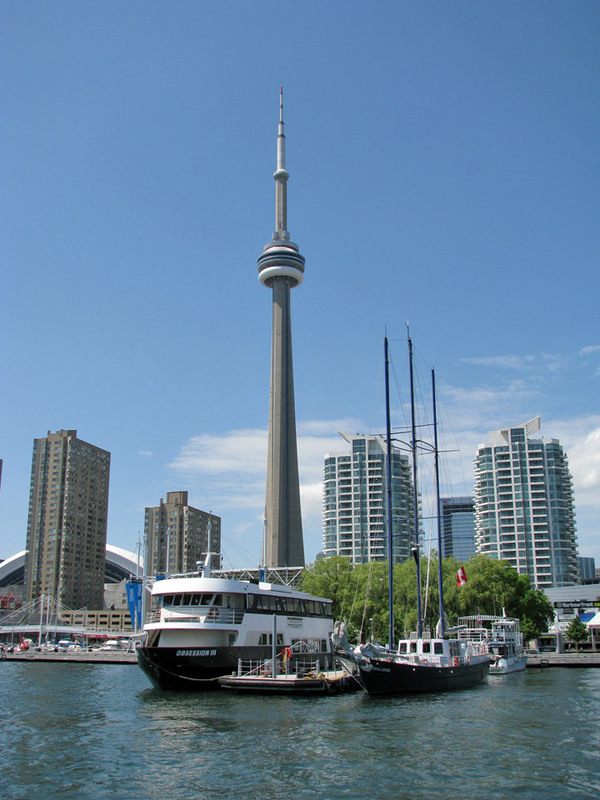 Construction on the CN Tower began on February 6, 1973 with massive excavations at the tower base for the foundation. By the time the foundation was complete, 56,000 tonnes (61,729 ST) of dirt and shale were removed to a depth of 15 meters (49.2 ft) in the centre, and a base incorporating 7,000 cubic metres (9,156 cu yd) of concrete with 450 tonnes (496 ST) of rebar and 36 tonnes (40 ST) of steel cable had been built to a thickness of 6.7 meters (22 ft). This portion of the construction was fairly rapid, with only four months needed between the start and the foundation being ready for construction on top. To build the main support pillar, a hydraulically-raised slipform was built at the base. This was a fairly impressive engineering feat on its own, consisting of a large metal platform that raised itself on jacks at about 6 meters (19.7 ft) per day as the concrete below set. Concrete was poured continuously by a team of 1,532 people until February 22, 1974, during which it had already become the tallest structure in Canada, surpassing the recently built Inco Superstack, which was built using similar methods. In total, the tower contains 40,500 cubic meters (52,972 cu yd) of concrete, all of which was mixed on-site in order to ensure batch consistency. Through the pour, the vertical accuracy of the tower was maintained by comparing the slip form's location to massive plumb-bobs hanging from it, observed by small telescopes from the ground. Over the height of the tower, it varies from true vertical accuracy by only 29 millimeters (1.1 in). In August 1974, construction of the main level commenced. Using 45 hydraulic jacks attached to cables strung from a temporary steel crown anchored to the top of the tower, twelve giant steel and wooden bracket forms were slowly raised, ultimately taking about a week to crawl up to their final position. These forms were used to create the brackets that support the main level, as well as a base for the construction of the main level itself. The Sky Pod was built of concrete poured into a wooden frame attached to rebar at the lower level deck, and then reinforced with a large steel compression band around the outside. The antenna was originally to be raised by crane as well, but during construction the Sikorsky S-64 Skycrane helicopter became available when the United States Army sold off theirs to civilian operators. The helicopter, named "Olga", was first used to remove the crane, and then flew the antenna up in 36 sections. The flights of the antenna pieces were a minor tourist attraction of their own, and the schedule was printed in the local newspapers. Use of the helicopter saved months of construction time, with this phase taking only three and a half weeks instead of the planned six months. The tower was topped off on April 2, 1975 after 26 months of construction, officially capturing the height record from Moscow's Ostankino Tower, and bringing the total mass to 118,000 tones (130,073 tons). 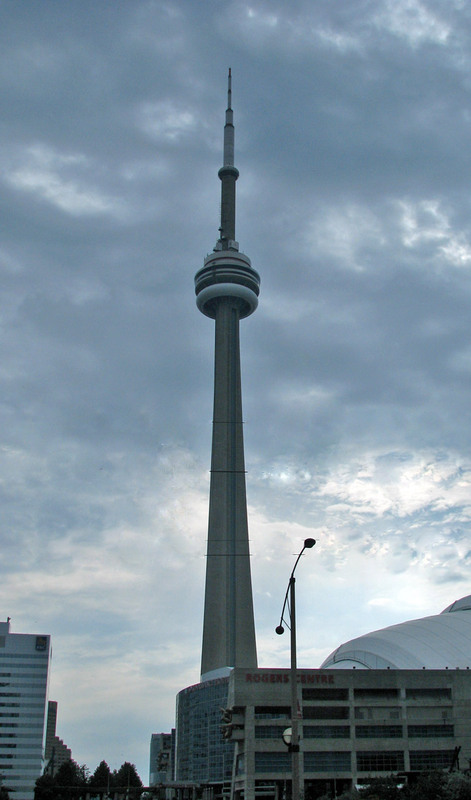 The CN Tower opened to the public on June 26, 1976, although the official opening date was October 1. The construction costs of approximately CDN$63 million ($330 million in 2005) were repaid in fifteen years. Canadian National Railway sold the tower prior to taking the company public in 1995, when they decided to divest themselves of all operations not directly related to their core freight shipping businesses. 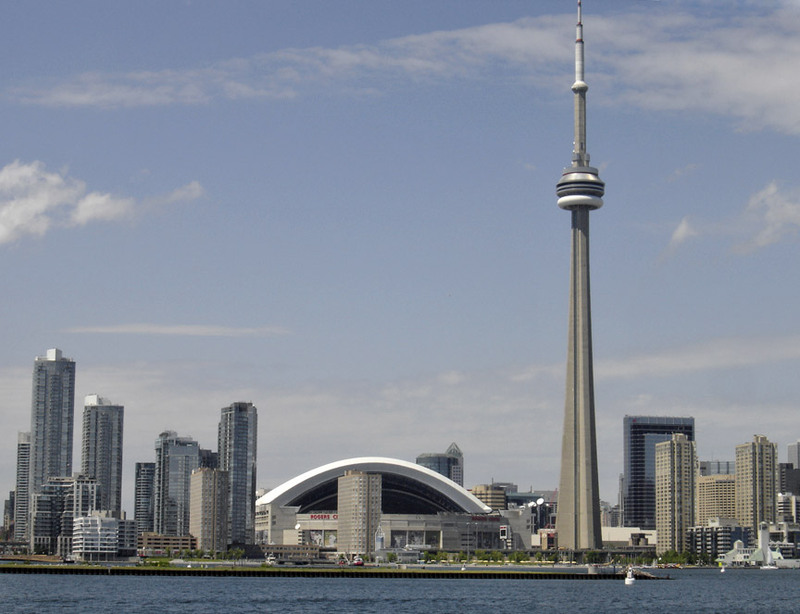 As the area around the tower was developed, particularly with the introduction of the Metro Toronto Convention Centre and Rogers Centre (known as the SkyDome before 2005), the former railway "wasteland" disappeared and the tower became the centre of a newly developing entertainment area. Access was greatly improved with the construction of the SkyWalk in 1989, which connected the tower and SkyDome to the nearby railway and subway station, Union Station. By the mid-1990s, it was the centre of a thriving tourist district. The entire area continues to be an area of intense building, notably a boom in condominium construction in the 2000s. From 1997 to January 2004, TrizecHahn Corporation managed the building and instituted several expansion projects including a $26 million entertainment expansion and revitalization that included the addition of two new elevators (to a total of six) and the relocation of the staircase from the north side leg to inside the core of the building, a conversion that also added nine stairs to the climb. 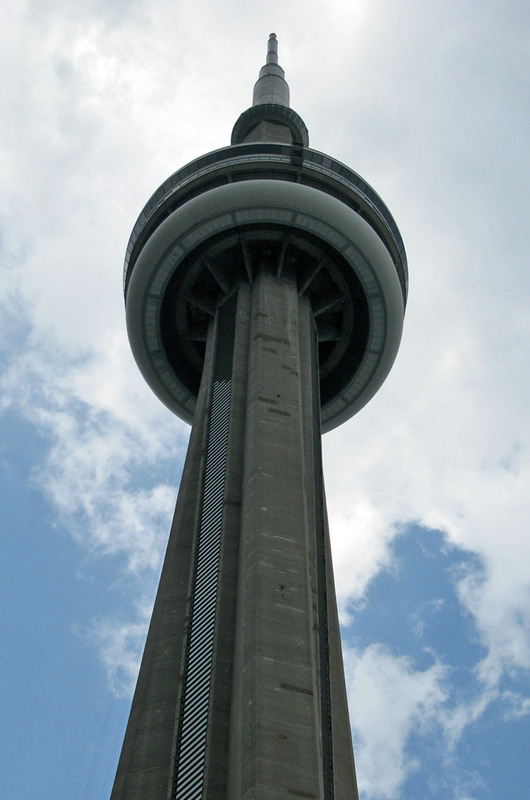 The CN Tower consists of several substructures. The main portion of the tower is a hollow concrete hexagonal pillar containing the six elevators, stairwells, and power and plumbing connections. On top of this is a 102 meters (334.6 ft) metal broadcast antenna, carrying TV and radio signals. There are two visitor areas: the main deck level (formerly known as SkyPod) located at 346 meters (1,135 ft), and the higher Sky Pod (formerly known as "Space Deck) at 446.5 meters (1,465 ft), just below the metal antenna. The hexagonal shape can be seen between the two areas; however, below the main deck, three large supporting legs give the tower the appearance of a large tripod. The main level is seven stories, some of which are open to the public. Below the public areas — at 338 meters (1,108.9 ft) — is a large white donut-shaped radome containing the structure's microwave receivers. The glass floor and outdoor observation deck are at 342 meters (1,122.0 ft). The glass floor has an area of 24 square meters (258 sq ft) and can withstand a pressure of 4,100 kilopascals (595 psi). The floor's thermal glass units are 64 millimeters (2.5 in) thick, consisting of a pane of 25-millimetre (1.0 in) laminated glass, 25 millimeters (1.0 in) airspace and a pane of 13-millimetre (0.5 in) laminated glass. Some people experience acrophobia when standing on the glass floor and looking down at the ground 342 meters (1,122.0 ft) below. In 2008, one elevator was upgraded to add a glass floor panel, believed to have the highest vertical rise of any elevator so equipped. The Horizons Cafe and the lookout level are at 346 meters (1,135.2 ft). The 360 Restaurant, a revolving restaurant that completes a full rotation once every 72 minutes, is at 351 meters (1,151.6 ft). When the tower first opened, it also featured a disco named Sparkles, billed as the highest disco and dance floor in the world. The Sky Pod is the highest public observation deck in the world. On a clear day, it is possible to see 100 to 120 kilometers (62–75 mi) away, to the city of Rochester across Lake Ontario in the United States, the mist rising from Niagara Falls, or the shores of Lake Simcoe. A metal staircase reaches the main deck level after 1,776 steps, and the Sky Pod 100 meters above after 2,579 steps; it is the tallest metal staircase on Earth. These stairs are intended for emergency use only and are not open to the public, except for three times per year for charity stair-climb events. The average climber takes approximately 30 minutes to climb to the base of the radome, but the fastest climb on record is 7 minutes and 52 seconds in 1989 by Brendan Keenoy, an Ontario Provincial Police Officer. In 2002, Canadian Olympian and Paralympic champion Jeff Adams climbed the stairs of the tower in a specially designed wheelchair.